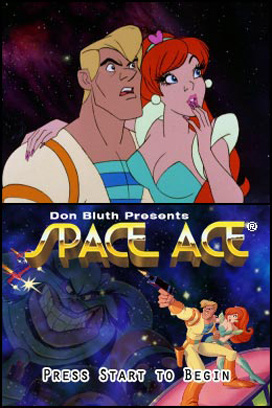 Originally released to arcades in 1984, Space Ace sought to recapture the magic of its predecessor, Dragon's Lair. And by "magic" we mean "ability to eat money." Gameplay was not high on the list of priorities for the team that designed these games, but flashy presentation certainly was. As a result, we are left with a visually stunning artifact of the golden age of arcade gaming...that just so happens to be borderline unplayable. 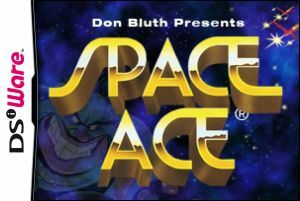 Space Ace on DSiWare is a faithful enough adaptation of the original game. It might be awful, but, if anything, that speaks to the accuracy of Digital Leisure's port. The alterations made are to the benefit of the game, but not by much. You take control of a space adventurer named Dexter, and must...no, wait. That's not entirely true, as you don't take control of anything. An animated film starring a space adventurer named Dexter plays on your DSi, while you press buttons to keep it running. Or, more often, don't realize you're supposed to press a button, or which button, or when, or why, and the film abruptly ends. Excited yet? Don't be. The film might be beautifully animated (in fact, it absolutely is), but the voice acting is spotty and the writing atrocious. If the only thing a game can do to keep you playing is promise you that you'll get to see the rest of a film, it had better at least be a good film. 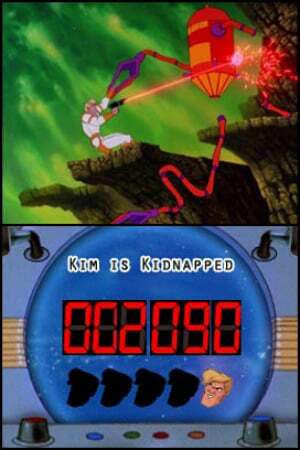 Space Ace is...well...pretty lousy. The plot revolves around Dexter rescuing his girlfriend Kimberly from the clutches of an evil Papa Smurf-ish character called Borf. With a setup this generic, any enjoyment one will garner from watching the film will be down to the strength of the writing, and, in Space Ace, it's just disappointing. There's more cheap sarcasm than actual humor, and, unless you find people screaming in silly voices funny, you won't find much to laugh at. The game consists of a number of pre-animated scenes strung back to back. You watch one, press the correct button or sequence of buttons, and then move on to the next. If you fail to press the right buttons, or don’t press them quickly enough, Dexter will die, and you will restart at the beginning of that scene. Often this requires you to watch at least one non-interactive sequence again, as they are not skippable, and the weakness of the writing really sinks the experience when you're listening to an exchange for the tenth time that wasn't funny the first go around. In many cases, the course of action is obvious. 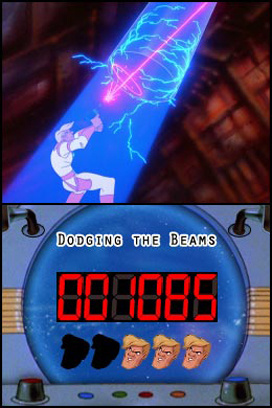 Avoiding projectiles, for instance, or hopping over pits, are second nature to all gamers. Other times, however, it's literally impossible to survive without having experienced that scene already. There's no way of knowing that a floor will crumble from beneath Dexter, or that a laser beam will zap him from above, unless it's already happened and you've memorized it. And unlike other brutally challenging games relying on precise pattern recognition (such as those in the BIT.TRIP series), mastering one scene in Space Ace won't make you any more prepared for the next. There's no skill involved; it's rote — and always unfair — memorization. We used up our full complement of lives three times just trying to figure out how to prevent death upon entering the space station early in the game, and when we finally did "solve" the puzzle, it was entirely a matter of mashing random buttons until something worked. 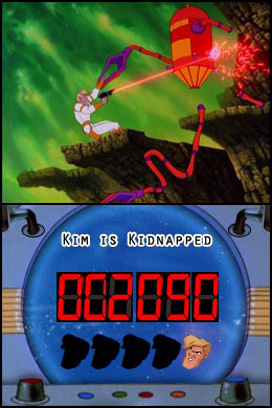 Not a great start, Space Ace. That said, there are some variations in the game which do serve to make it more interesting, if not exactly more fun. At various points in your adventure, you will be given a prompt to ENERGIZE. If you press the action button, Dexter will transform into Ace, his space-adventuring alter ego. Interestingly, this is not mandatory, and you can keep playing the game as Dexter if you so please. While playing as Ace, however, the events play out differently. Where Dexter must dodge or evade creatures, Ace can battle them. It doesn't change the gameplay at all, but it does present a new series of prompts to memorize, which, we guess, could possibly be fun to somebody foolish enough to want to play through Space Ace twice. There are also mirrored sequences in the game, which play out identically to their "normal" counterparts, but switch the correct buttons from left to right, and vice versa. Whether a normal or mirrored version of any particular scene loads seems to be purely random. As far as the port itself goes, it's pretty strong. The video is smooth and the audio — while embarrassingly acted — is clear. It's the game itself that you'll regret buying, and it's a shame that the effort that went into producing this port wasn't invested in a game more worthy of preserving. If you can't find a better way to spend 800 points, somebody should take away your credit card. Like Dragon's Lair before it, Space Ace was designed to eat as many quarters as it could, as quickly as possible. And while this was obviously a result of its place in time, it does not make for a very rewarding gaming experience today. If you are specifically looking for a game that will frustratingly force you to repeat unforgiving sequences until you've memorized them, just so that you can move on to another set of sequences that expect you to do the same, then look no further. If you'd rather spend your hard-earned money on something you'll enjoy, however...keep walking, and don't look back. I wonder if we'll get the SNES version on VC. You Jamaican jerk, chicken. Shame on you for hating these classics. Corbie gave Dragon's Lair DSiWare a 7/10, you know, and he's all about playability. While I haven't played Space Ace yet, I loved Dragon's Lair back in the day for the genuine challenge of thinking and reacting fast enough to get through some of the chambers; there was also memorization involved, but that was just a part of the intensity and pressure (which side of the stairs is going to collapse... dang, I needed to duck that bat first!). Maybe I do find people screaming in silly voices funny. I totally disagree with this review! Space Ace on Dsiware is a good port of the arcade original. I grew up playing both Dragon's Lair & Space Ace in the arcades and loved them! I was more than happy to download them both to my Dsi, and guess what my credit card stays right where it is! If you like Dragon's Lair then get this. Just ignore the review and get this. @HP3: As I mentioned in the review, this is indeed a good port of the arcade original. I made a point of that so that folks who already know they like the game will understand that my problems with it were not specific to the port. 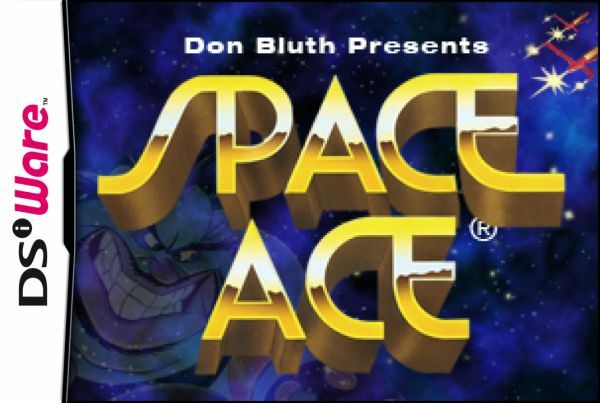 I don't feel that Space Ace has aged particularly well in terms of playability or enjoyability; that's entirely separate from the fidelity of the port, which is, in itself, quite good.
" If you are specifically looking for a game that will frustratingly force you to repeat unforgiving sequences until you've memorized them, just so that you can move on to another set of sequences that expect you to do the same, then look no further." To me, this describes Bit.Trip Runner. 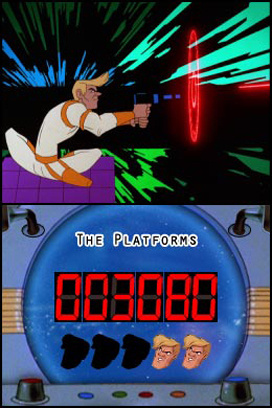 Can you comment on what differentiates the Dragon's Lair style from the Runner style of game play? I have always had an interest in the Lair games, but have never gotten around to purchasing them. I like these games, but still think it's a great review. I have Dragons Lair on my iPhone. I got it for 99 cents and it was a complete waste of money. What a terrible, terrible game. I'm not shocked that Space Ace doesn't hold up either. I'll be getting the Dragon's Lair Wii Collection for $29.99 and have a better experience. @DrKarl: I haven't played Space Ace or Dragon's Lair (except for maybe once or twice in an arcade over 20 years ago), but I don't think that BT Runner is at all in the same category. Nothing in Runner ABSOLUTELY REQUIRES memorization if your reflexes are good enough, though in most cases it will be required for normal humans. However Runner makes heavy reuse of obstacle patterns within each level, so instead of learning every move at the micro level, you learn to beat that pattern and then remember larger patterns at the macro level. Runner can still be a very frustrating game, but I don't think it falls into the unfair category the way it sounds Space Ace does. In Runner there are always visual cues that gives you a chance to respond to every obstacle. It's not like I can defend this game, but the reviewer is clearly biast against memorization games like this. Should've gotten Corbie, is all I'm saying. Definitely not biased against games that require memorization. The oft-cited Bit.Trip: Runner arguably requires memorization, and is fantastic. A little closer to home, Dragon's Lair itself still manages to be a fun enough experience, though I think it's overpriced at 800 points. Disliking a game does not imply bias. Yeah, thought it looked like Dragon's lair. The only thing missing from this DSiWare game is an arcade from 1984 to go with it. And my youth. Oh, and quarters. Lots and lots of quarters. I’ve come to trust the reviews on this site when making DSI-Ware purchases. This review, however, is horribly bias and assumes the end-user is either to stupid to play the world famous Laser Disc games or to “advanced with modern 3D games” to even care for the classic that is Space Ace. This review lists some aspects as “variations” yet these gaming techniques were available in the original arcade version. This game is a classic; it has been faithfully ported to DSi-Ware. While sound and animations are not perfect, neither is the MOBI codec, the game play remains just as fun as it did the first time you dropped a quarter into the machine. That was a general comment about variations in the gameplay being available if you choose to Energize, which leads to different puzzles and sequences. It was not meant to suggest that these were variations unique to the port.